Salted sidewalks, de-icing chemicals, and dry heat cause foot licking, toenail damage, itchy skin and other winter woes of dog grooming. 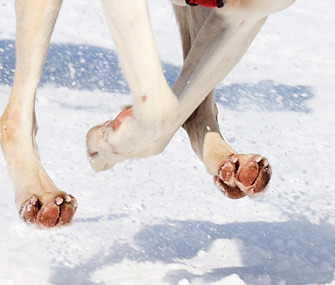 Every winter I see problems with dry coat, itchy skin, foot pads exposed to salt and de-icing chemicals, chewing toenails (yes, dog do that) and excessive foot licking. Winter is a very hard time of year for pets. As the days shorten, the lack of sunshine brings about changes in coat growth. Many breeds grow an extra layer of undercoat, the thick wooly “pelt” that insulates a sled dog or a working collie on the misty, rainy hills of Yorkshire. Giving him a CLEAN COAT is the kindest thing you can do for your dog. A clean, well-brushed coat, professionally bathed, dried completely down to the skin, meaning the loose undercoat has been lifted and raked out, cuts down on the amount of hair in the home, and reduces the allergen-causing dander that results from dry itchy skin. Read that paragraph again and follow the logic. Many people think a dog doesn’t need bathing in the winter but that is the most important time of year due to the dry, heated inside air. You might think about that for your own hair… Also, a CLEAN coat insulates because it layers properly, trapping air under the top coat to hold body warmth. For dogs who love to play in the winter snow, use a silicone based spray-in conditioner to repel snow from the coat. 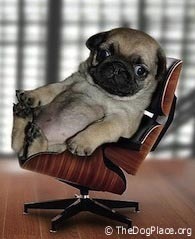 You can purchase this at most pet supply stores. Check ear tips and toe pads regularly for frostbite. Even if your dog wears booties or foot pads, do not leave him in the snow or ice for more than 30 minutes at a time. If ice has formed between the toes, place the feet in luke-warm water to facilitate melting and then dry thoroughly. TIP: use a towel or chamois first, then blot with a paper towel to absorb the last bit of moisture. Keep hair on paws and between pads trimmed. Toenails should not touch the floor. Long nails make footing treacherous, can be broken off, and also can damage pads and the muscles that support the foot, leading to orthopedic problems. Snow and ice-melting chemicals can burn tender feet and pads. Subsequent licking and ingestion can not only make your dog sick but can be a diagnostic nightmare! Rinse feet well after every time outside unless you can convince your pet to wear paw protectors. A good coating of Udder Balm (lanolin) can help soothe dry chapped feet and noses. And don't forget: a little extra omega 3 fatty acid supplement will help keep coat and skin in perfect condition! Be careful of winter burn on white and light colored dogs and use a sunscreen approved for pets!!! Especially in winter, a professional groomer is your pet’s best friend! Don't miss Dog Safety Tips by AKC Group Judge Katie Gammill who also warns about winter weather. "A word about winter. A dog’s pads can freeze to anything metal and the pads are difficult to treat." 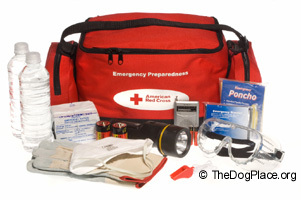 Jordan, DVM on Emergency kit supplies, what you MUST have. 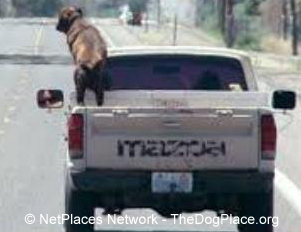 Puppies, like children, need safe surroundings and monitoring.